Tipburn in lettuce has been a problem since the first farmer planted lettuce. Any grower will at some stage have the problem occur to some extent on his farm during warmer periods. The classic tipburn symptom is necrosis of the tips of rapidly growing young leaves. Tipburn is visible externally on butterhead and cos types, but with crisp head or iceberg types where head formation is more prominent, the disorder is found internally. This is a problem since the grower will only see the effects once the heads have formed and ready to harvest. Note that tipburn is not a disease, it is a physiological disorder caused by a combination of genetic and environmental conditions. Tipburn is not just a disorder found on growing plants, if harvested head are stored at too high temperatures, the symptoms may start to develop in storage. Similarly if harvested products are not cooled down quick enough, symptoms may develop over time and be prominent when the consumer opens the heads. Tipburn is an induced calcium deficiency of the young, rapidly growing lettuce leaves. So it is not an absolute deficiency of calcium since the disorder occurs even when adequate levels of calcium is found in the nutrient solution (and in soil for field grown lettuce crops). It does not occur on older leaves since they have enough calcium and the inner structure of the cells are stronger than compared to younger developing leaves. Leaf analysis has shown that leaf tips just prior to developing the disorder had significantly less calcium than the areas adjacent and also less calcium than similar leaves without the disorder developing. This is clearly an indication that it is not an absolute deficiency or nutrient deficiency but induced deficiency. Tipburn is a result of the collapse of membrane and cell walls. The calcium deficiency contributes to the weakening of the cell walls and membranes causing them to rapture. Calcium is not very mobile in the plant and requires water movement (transpiration of leaves and stems) for transport and distribution throughout the plant. That is why foliar sprays have been so successful in preventing the disorder, although it is not effective in iceberg and crisphead types. 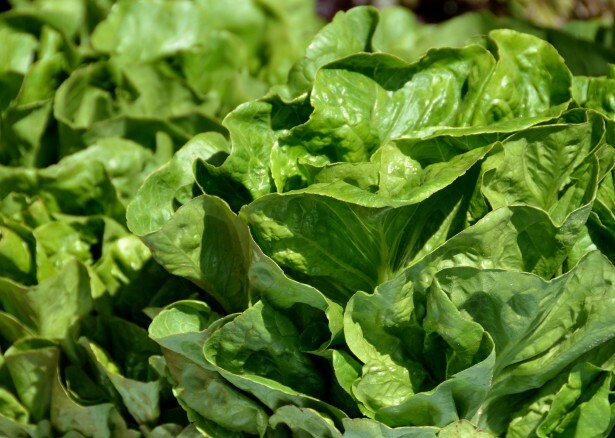 Foliar sprays are not that effective with iceberg or head types of lettuce since the symptoms occur inside the head. The xylem is the main pathway for calcium transport. Transpiration is the main force behind this movement. So if transpiration is reduced, calcium distribution will be affected. Also any leaf or tissue that does not transpire effectively, will also have reduced concentrations of calcium. For instance, high humidity can induce calcium deficiency since transpiration is directly influenced by water vapour gradient. Increasing humidity and lowering EC (electrical conductivity) of the nutrient solution during the night has limited success and its effect is variety dependant with more success towards butter lettuce types. It is also evident that fast growing lettuce have higher chance of developing these symptoms. This is directly related to the calcium demand of the plant. The grower must balance growth rate with calcium supply to minimize the probability of the disorder developing. Interesting to note that higher planting density reduces the occurrence of tipburn compared to low planting densities. Tipburn in lettuce is a bigger problem under controlled environments such as greenhouses than under shade cloth. This could be due to higher relative humidities and faster growth rates during the day compared to other structures. Careful management of growth rate, nutrient concentrations, temperatures and night humidities will reduce the probability of this physiological disorder developing.